I have always fascinated about the powers of the Bionic man. Bionic man is a very wide term whose pinnacle would be to create an artificial being. Today research in that area is progressing – an example of that is the stem cell. But talking about that would be science-fiction. So lets talk about something more real. …so what about the present? run at great speeds, and even fly! Do you think such things could really exist, today? Yes, it happened last year at IIT. I was amazed when I saw people wearing a mechanical exoskeleton and jumping over a entire car in a single leap! During Techfest 2009 a team of performers called “3Run” from UK displayed a stunning Parkour performance! 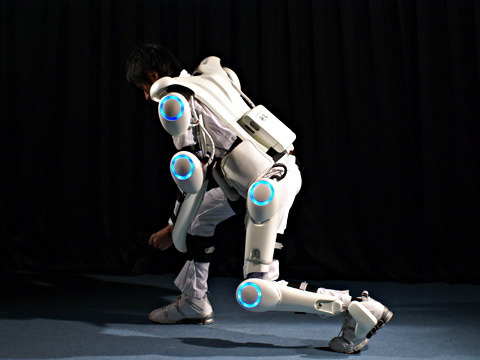 Two of them were wearing exoskeletons (3Run doesn’t mention this on their website) which I believe looks just like the ones produced by PowerSkip, a German company. Heat-strokes are common for warm indian climates. Cited heat discomfort as the primary cause of people not wearing driving helmets. Hence reducing safety of drivers and co-passengers. Bulky, inconvineant to carry around everywhere. Inexpensive solution to an important problem at Rs. 150/- extra cost. About 1/3rd of original size when folded. Modular design – sleek but makes it very vulnerable to impact damage. Hence putting the user at hazzordus risk. Defeats the primary purpose of safety. No Impact Testing of equipment was performed. Clips, screws etc. inconvineant and time-consuming to remove/fold and install back again while. Removable parts not a good design idea. Prone to loss. No temprature controller proposed in the design. I think resonable maintenance of temprature is essential. Too cold/uncontrolled temprature might be more damaging than comforting.